When it comes to getting cavities, it’s not only the amount of sugar, but how frequently it’s consumed that counts. One great way to remember this is the phrase “Sip all day, get decay.” Whether it’s food or a beverage, encourage your kids to consume anything sweet in one sitting, rather than spreading it out over the day. It’s always important for children to brush and floss regularly, but it’s especially important during the holidays when they’re eating more sugar than usual. It’s also a good idea to pick up some fluoride mouthwash (also called anti-cavity formula) at the store for kids over age 6 to use each day. Making water the beverage of choice in your family is a great way to reduce the risk of cavities. In addition to helping your child stay hydrated, it also washes away the plaque and residual sugars that contribute to tooth decay. For children over age 5, chewing sugar-free gum is a convenient, easy way to prevent cavities on-the-go. It works by stimulating salivary flow to wash away food debris and plaque, and also neutralizes acids in the mouth that cause decay. Regular checkups with a pediatric dentist are a big part of your child’s oral health. They’re a chance to make sure your child doesn’t have untreated cavities, get their teeth professionally polished, and also have a fluoride treatment done to strengthen their enamel and prevent decay. The holidays are a time of year that’s filled with laughter, fun and great food. With these tips and tricks, you can help your child enjoy them – without spending any time in the dental chair! Dr. Mira Albert is a pediatric dentist in Hinsdale who is passionate about helping every child have great oral health. 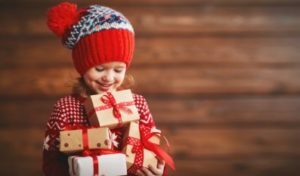 As a firm believer in the power of prevention, she always educates patients and their parents on how to help their children enjoy the holidays and maintain good oral health at the same time. If you have any other questions, she can be reached via her website or at (630) 504-2223.